Dublin, Ohio, USA » Panhandling in Dublin – What is it and what can we do about it? Panhandling in Dublin – What is it and what can we do about it? You’ve may have noticed panhandlers in several locations, including the entry/exit into Perimeter Center, Avery Center and recently the plaza at Bridge and High Streets. Generally, there are two types of panhandling: passive and aggressive. Passive panhandling is soliciting without threat or menace, often without any words spoken – just a cup or a hand held out or maybe holding a sign. Aggressive panhandling includes soliciting coercively, menacing actions and a stated or implied threat. In Dublin, the panhandlers are generally passive panhandlers. Most do not engage in aggressive panhandling. Why are they panhandling in Dublin? Typically, relatively few panhandlers account for most complaints to police about panhandling. Most studies conclude that panhandlers make rational economic choices–that is, they look to make money in the most efficient way possible. Panhandlers need to go where the money is. In other words, they need to panhandle in communities and specific locations where the opportunities to collect money are best–where there are a lot of pedestrians or motorists, especially those who are most likely to have money and to give it. Sometimes those engaged in panhandling are going through something else in their lives like drug dependency. Simply giving them money allows them to feed these potential habits and avoid the help they really need. Can the City pass an ordinance to prohibit panhandling? Courts have ruled that passive panhandling is constitutionally protected activity. Panhandling is a form of free speech entitled to First Amendment protection. The City cannot prohibit passive panhandlers who are located in public places, such as sidewalks, and are not creating a safety concern or trespassing. If a panhandler stands on a highway for the purpose of soliciting contributions from the occupant of any vehicle, then Dublin Police could take enforcement action. However, this act must be witnessed by a police officer in order for enforcement action to be taken. Many panhandlers move along to another location or stop panhandling when they know they are being observed by police. What can we do about panhandling? Should you ever feel threatened, call 911 immediately to contact Dublin Police. Enforcing laws against panhandling plays a relatively small role in controlling the problem. Public education to discourage donations, and providing adequate access and availability of social services are more effective tactics in a comprehensive community response to panhandling. 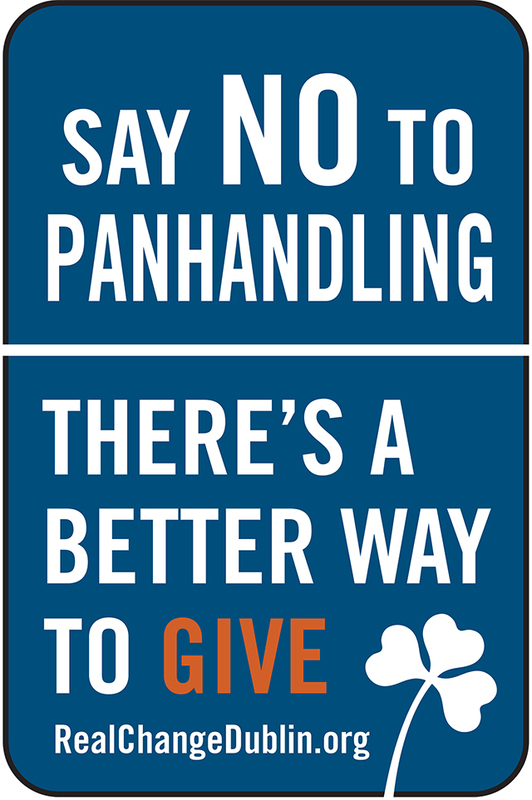 Thanks to recommendations from residents and City Council’s leadership, the City is installing Say NO to Panhandling street signs in a few locations to encourage a better way to help those in need. The City of Dublin encourages people who want real change to give money to social service and charitable organizations instead of giving money to panhandlers. You can donate to a variety of organizations in Central Ohio. Do not give panhandlers money or anything of value! Do not be fooled; food, shelter, and assistance are available to those in need. Panhandling for drugs or alcohol is very common. Do not be angry or feel guilty, there are better ways to assist the homeless. While in a vehicle, do not roll down your window or engage in conversation with those standing on the side of the road panhandling. Think about your liability if a panhandler gets struck by a vehicle while coming to you for money. Ultimately, the issue of passive panhandling in Dublin is a community issue where everyone needs to help by not contributing money to panhandlers. If they don’t receive money, they will move on to another location. Dublin Police officers also carry community resource cards to direct panhandlers to the help they need. Explain that sometimes these people begging for money are in need of help because they are going through something else in their lives like drug dependency. Giving them money allows them to buy more drugs and alcohol which is not the kind of help they need. Talk to your child about the kinds of resources that will give panhandlers the help they need, like the Dublin Food Pantry or area shelters and charities where the family can make a donation to help people in need. Discuss ways in which you and your child can volunteer to help make a difference for people in need either through your church, local organizations or the schools. Explain that stopping the car to offer a donation might be a traffic safety issue for the person begging for money and the drivers in their cars stopping in the intersections.